Begin your home remodeling project with a visit to our flooring showroom. We offer thousands of different options that work well in a house or a place of business. Work with our sales and design professionals to determine the best type of flooring for your space. When you want timeless beauty, easy care and maintenance, and solid durability, choose tile flooring. Improve the appeal and value of your home by adding a tile floor. This timeless classic has been a popular flooring option for thousands of years. This is because tile offers all the features everyone wants in flooring. Tile floors are handsome and complement every décor. Tile is strong and enduring so it lasts for many years. Plus, tile flooring installation in a home or business makes good sense because it is resistant to water and scratches. Modern Porcelain Tile: Modernize your home with the contemporary appeal of porcelain tile. Porcelain has a streamlined subtlety that enhances any decorating style. This type of tile is in the middle of the price range and offers an extremely low water absorption rate. What this means for you as a homeowner is that porcelain cannot be damaged by water. It stands up to liquids and moisture of all sorts and remains strong. In addition, it does not stain. Elegant Ceramic Tile: When you think about elegance and refinement, think ceramic tile. This type of tile is loved for its classic beauty and heightens the appeal of a room. Made from clay that is fired in a kiln, ceramic is strong enough to resist fire, frost, and liquids, yet soft enough to cut easily and install. This type of tile costs less than the other two. Rustic Slate Tile: Quarried from the earth and cut into tiles, slate is stone that comes in the rich colors of the earth - gold, green, rust, blue, and gray. This type of tile costs more than the other types of tile flooring, but offers you the enduring beauty of natural stone. 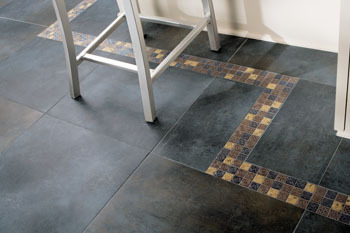 The rustic beauty of slate takes center stage in any room. The professionals in our flooring showroom want you to be happy with your new tile flooring for many years to come. This is why we recommend professional installation. Our in-house installers are experts with the training and experience to prove it. We have the skills and knowledge to install your tile flooring for full beauty and longevity. If you have installation issues with 4-star and 5-star-rated flooring, we make everything right at no cost to you. Contact us today for guidance in selecting the type of tile that works best in your space. We proudly serve customers in and around Worcester, Massachusetts.